The historical buildings from old coffee times were all restored, transformed and repurposed into spaces for creative, professional e personal events and activities. All of them have internet access with speeds of up to 100mb/s. With over 500m2, it is the main building of the farm. 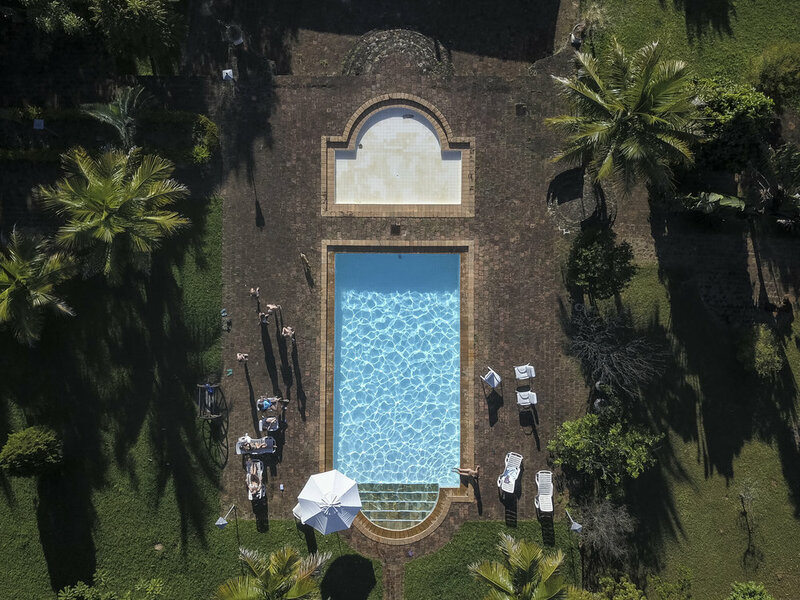 Built in the end of the XIX century to store and benefit the coffee, it now hosts events for up to 300 people. It has different room, among them (i) a professional kitchen; (ii) a wide 100m2 room for workshops and meetings (iii) a room with tables and chairs for up to 30 people; (iv) a dorm for up to 10 people. The space is decorated with antique and contemporary furniture and equipped with tables, chairs, whiteboards, prototyping materials, projector, ar conditioning and much more. 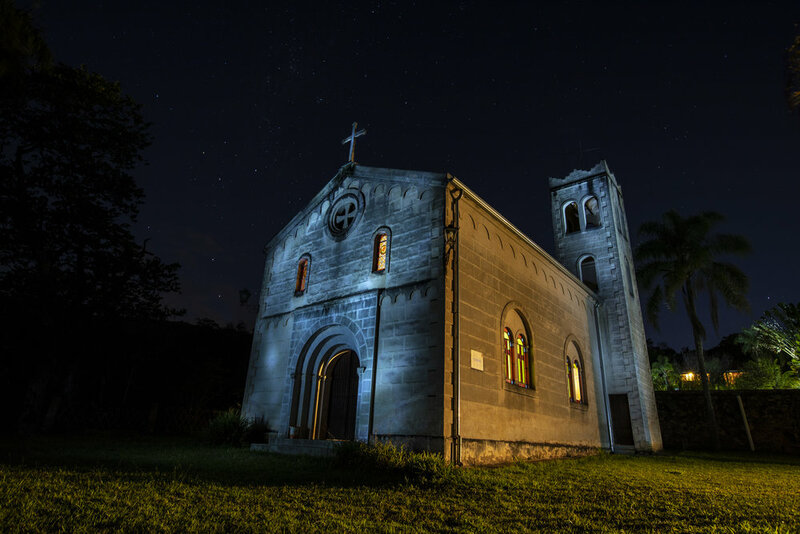 Inspired in the Spanish church Sant Climent de Taüll (XII century), it was built in the end of the 1950's. In its over 100m2, it has original paintings from the the Catalan painter Francesc Domingo Segura and an acoustics that enchant all musicians that perform on it. Today it hosts special moments and experiences, like weddings, concerts, talks, workshops, music and dance residencies, among other cultural and creative dynamics. 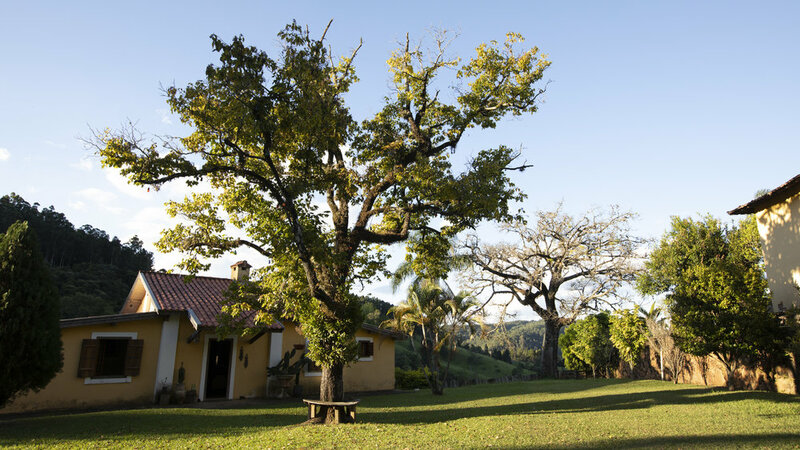 The Yellow House (Casa Amarela) is a former workers house completely remodelled to be the farm's main guest house. It has three rooms ensuites (and the dining room can be turned into an additional room), a fully equipped kitchen, an amazing balcony, fireplace and a lot of privacy. It can host up to 12 people. For more info and to rent the house, you can access our AirBnb profile. 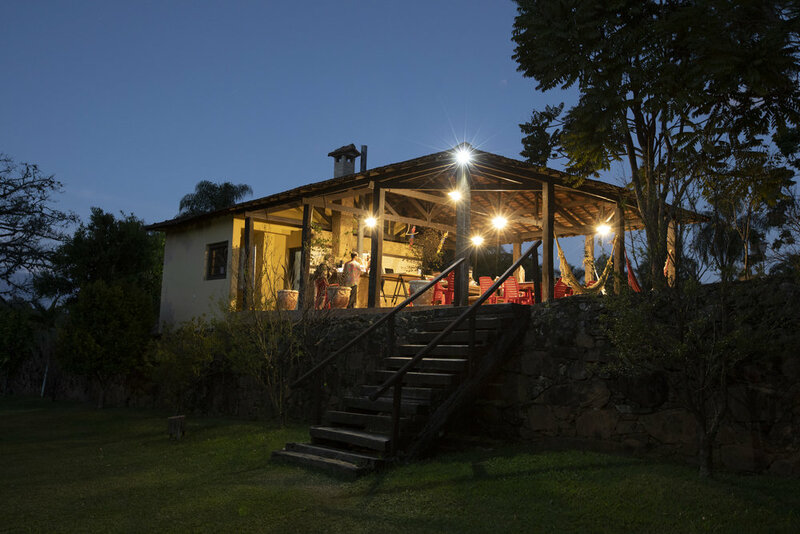 Located at the heart of the farm, it is a wide space, with a BBQ area, wood stove, pizza stove, sauna and bathroom. It is surrounded by beautiful coffee fields and lawns where we do body practices and bonfires. It was an amazing view to the nature. Here we host meetings, meals and other special celebrations, day and night. Swimming pool, sauna, waterfall, vegetable garden, woods, trails, animals, fruits, shadow, balconies, cinema, tables in the garden, mats to lay down in the grass... at the farm we have plenty of choices for you to spend you time in a pleasant, creative and inspiring way - be it during an event, with your friends or by yourself. Nature can inspire us, renew us, move us and teach us a lot. 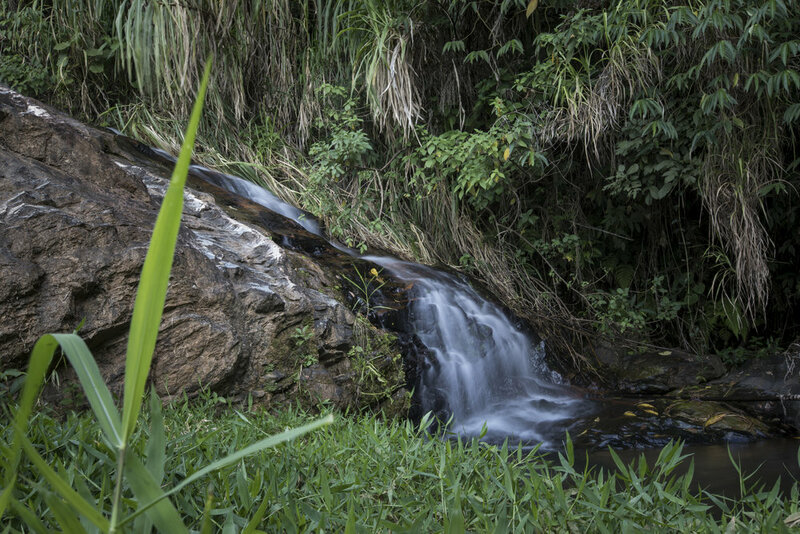 At the farm you can make treks in the nature, enjoy waterfalls and ponds, watch the birds, help in the vegetable garden and interact with nature in many other ways.